As I seem to be in card making mode I thought I would join in for the first time with the LIM challenge which this week is circles. 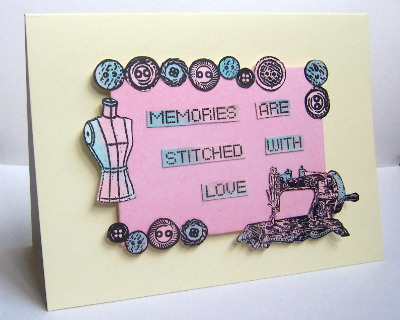 I used these pretty sewing themed stamps by Creative Expressions coloured with Distress inks. I hope I ticked all the boxes for the challenge...it's been a while since I've done one. Lovely card Chris, great colour combo too. I have this set out on my desk at the moment! It certainly does chris, i love it! It great to see you joining in our challenge at Less is More! Your card is super, I really hope that you will be able to join us each week from now onwards!